Engagement Shoot season is coming up, so I thought I would write a helpful post with my hints and tips for your photoshoot! Engagement Shoots, or pre-wedding Couple Shoots, are a great idea as you approach your wedding day, and many photographers offer them as a part of their wedding services. They give you an opportunity to get to know your wedding photographer, and to get used to being in front of the camera, in preparation for your wedding day. You will see how your photographer works, and you will be able to find out what looks best for your actual wedding photos. It will be a lot of fun, and you will end up with some great pictures to remind you of the days before you got married! In my experience, I always find that couples really benefit from having an Engagement Shoot, as they then feel a lot more relaxed, comfortable and confident about the photography on their wedding day. This leads to even better photos on the day itself! So, while you may feel a bit unsure about doing an Engagement Shoot, it actually will be a really worthwhile investment of your time, and you will definitely enjoy it once you get into it! 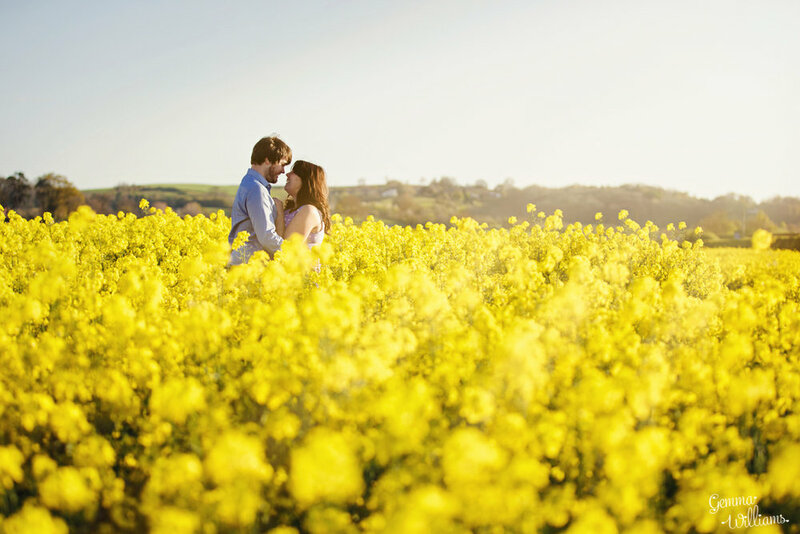 Choosing a good location can make your Engagement Shoot really amazing. I always recommend that it should ideally be somewhere that means something to the two of you, and suits your style – maybe somewhere that you like to visit together, a stroll you took on a first date, the picnic place you loved, the river where he proposed, the pretty village with that cake shop you always have to go in, or the beach where you leapt off the sand dunes that time…. or even romantic destinations like Paris or Venice (I don’t mind travelling!). It’s also great if your chosen location has a variety of different backdrops for us to work with, to give you many different photo opportunities. You could choose two different locations if you would like to have a contrast in your backdrops, for example urban and countryside. I can help you come up with some suggestions if you are stuck for ideas. It’s always great if it’s somewhere that means something to you though, as it will make your pictures even more memorable. Some couples like to go to their wedding venue for their pre-wedding Engagement Shoot, which is also a great idea. It gives your photographer a chance to explore your venue if they haven’t been there before, and together you can find your favourite spots for photos, so that you know where you want to shoot on your wedding day itself. 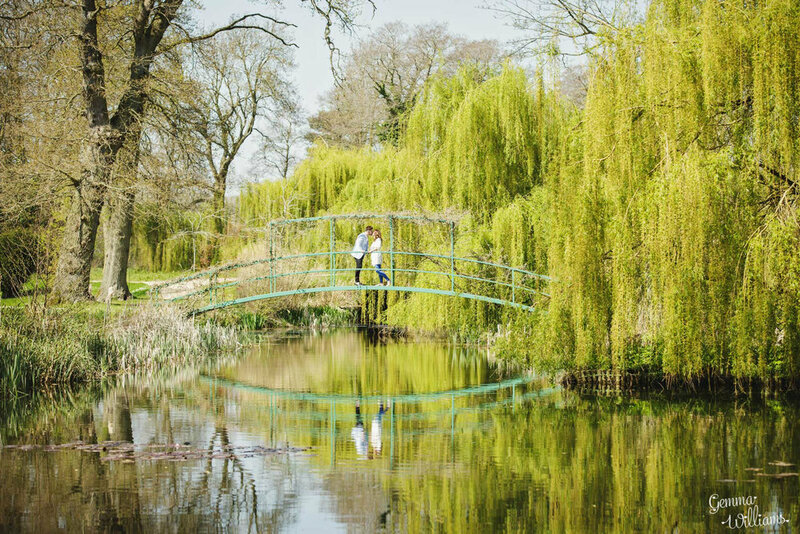 It’s also nice to get an extra set of pictures from your wedding venue, as on the wedding day itself there may not be time to do so much exploring around the grounds. Other couples decide that they would prefer not to go to their wedding venue for their Engagement Shoot, as they want a different look for their pictures – that’s totally fine too. The choice is yours! Just a note on permissions – some locations, such as country houses etc, may require that you get permission to have a photography session there. It’s always best to check first. 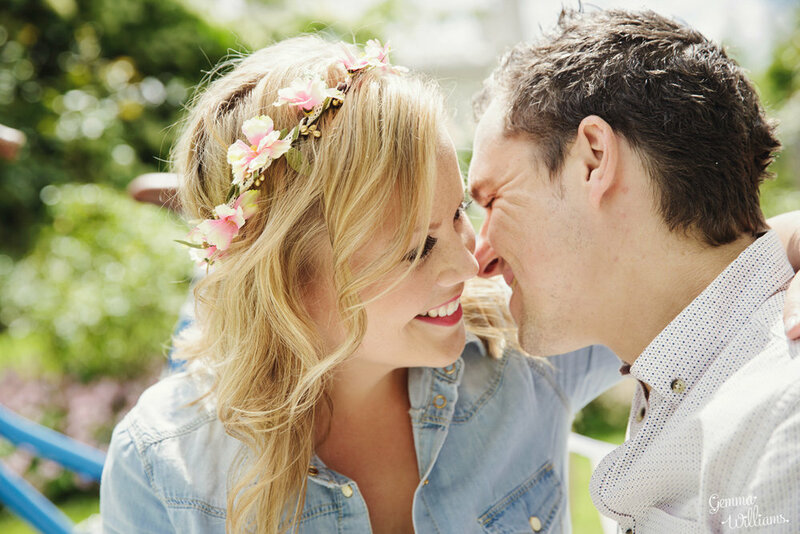 The majority of my Engagement Shoots tend to take place in the Spring, as this is a really lovely time of year, with all the blossom and spring flowers and foliage appearing. The weather is usually pretty ideal too. It’s also good in terms of time before the wedding – I usually recommend that the Engagement Shoot happens about two to three months before the wedding day, as this is far enough away for you to not be super stressed, but also close enough so that you still feel the benefit of the photo practice when the wedding day arrives. 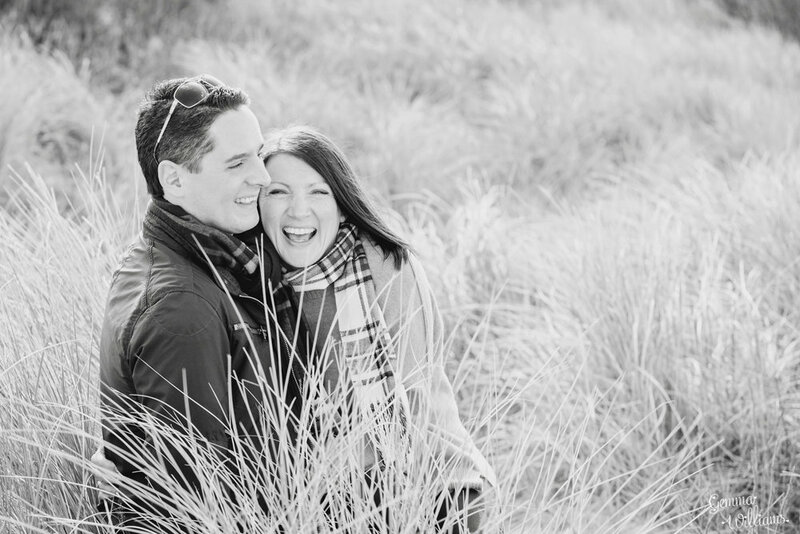 Having said that, you can choose to have your Engagement Shoot at any time of year. Perhaps a particular season is more important to you – maybe you met in the autumn, or you really love snuggling up in woolly jumpers in winter. The different seasons give so many different photo opportunities, and it is great to make the most of these, for example playing in the colourful leaves in the autumn, relaxing in summer meadows, or cuddling up in crispy snowy winter scenes. A little note on what time of day to have your shoot – if it is sunny, the light gets nicer as you go later into the afternoon, so if the diary permits, try to schedule your shoot for afternoon or later. I absolutely love the ‘golden light’ you get as the sun starts to set, so if you’d like to do a sunset shoot, I’m definitely up for that! Deciding what to wear for your Engagement Shoot can be a bit of a nightmare! But don’t worry – the main thing to remember is that if you feel good in the outfit you’ve chosen, this confidence will make a big difference in the photos. Go for clothes that suit you and your style, so that you feel like you are being true to yourselves when you look back at your photos. I want you to feel happy for the photos, and wearing something you feel confident in will be a huge boost, and will make it more fun. Between you, choose a look that you want to have for your photos, so maybe you want to be smart, or casual. It’s best to both be smart or both be casual, as then you will complement each other’s look. Also bear in mind that it needs to be suitable for the location, so if you’re going to be on a muddy farm for instance, make it all about the fun wellies look! Or if you’re on the beach, flip flops and shorts. If you want to really make your photos special, after all it’s not every day you get a professional photoshoot, then go for it with your outfits! – girls wear that gorgeous skirt you love, and boys smarten up a bit! Maybe you have chosen a quirky location for your shoot, or somewhere a bit vintage, so choose your outfit to match, such as a cute 50s-style dress for you, with a waistcoat and bow tie for your man. If you make an effort it will make so much difference. Maybe bring along a change of outfits if you want to mix things up – relaxed first and then change to dressy for example. Weird tip, but please don’t carry anything in your pockets. Phones, keys, wallets etc will make your clothes look lumpy and I hate photoshopping mobile rectangles off legs! I have room in my bag to carry anything if you want to empty your pockets before your shoot. Just remember to collect it back! People often ask me what colours they should wear or avoid. I generally recommend choosing colours that go well together and won’t clash, so for example, if your other half is wearing a red shirt, don’t wear orange yourself. Choosing different, but complementary, colours is the best idea. You don’t want to match each other, but you do want to coordinate. I also find that really bright, vivid colours can sometimes reflect a colour cast up onto your face, so I generally advise against strong pinks etc. I always tend to prefer more neutral and pastel shades, as I think these colours look lovely in photographs, but that’s just me, and everyone is different. Think about the textures too, and how they go together – I love lace, woollens, and cottons. I also love accessories – necklaces, bracelets, scarves, hats, belts etc… At the end of the day your outfit choice is entirely up to you and how you want the styling of your shoot to look, so wear whatever you fancy. You will look fabulous! There’s nothing like a good prop at a photo shoot. Props and activities can be a great addition to style your photoshoot or to make a fun picture, making it really unique to you – and it can make it easier to be in front of the camera if you have something to do. Feel free to bring along anything that is relevant to you both, maybe your favourite books if you like reading, a hamper, blanket and pretty cakes if you want it picnic stylee (although I might eat your cakes), a bunch of flowers, a giant balloon, your surfboards if you’re sporty, your dog, your cat, or your VW camper. You could also bring along things that also might be featuring on your wedding day, or things that tie in with your wedding theme. If there is something specific you’d like – talk to your photographer about it and maybe they can make it happen. It’s great to share creative ideas! Perhaps there are activities that you can do at your chosen shoot location. Maybe you can hire a boat to row on the lake, or have an ice-cream on the beach. I’ve also done shoots involving crazy golf, and bowling, which were fun! That said, props aren’t compulsory. If you would like it to be just the two of you being together, that is absolutely fine too! A note on bringing your dog – some venues or locations might not allow dogs, so check with them before you pop your pet in the car. Every time I say this I know it sounds stupid, but try to pretend like your photographer isn’t there! I know this is hard when I am bouncing about in front of you with my cameras. But really! I want to capture the interaction between the two of you – the natural personalities, the love, the laughter, the romance and the silliness. I would much rather capture a picture that looks real, than one which is posed and fake. So don’t worry about me – I am just there to photograph the moments between the two of you. You can move about, chat, laugh, hold each other, spin round, whatever you feel like. I’ll help you out if you don’t know how to stand or what to do with your hands, and I’ll make sure you are always looking your best with beautiful light and backgrounds behind you – so don’t worry. Sometimes I’ll ask you to look at the camera, but you can still just keep it relaxed and natural. I know it will be weird at first, but it really will get easier as our session goes on! I’m speaking for myself here, but I’m sure that any other photographer would share the same view too! Most people hate having their photograph taken, but don’t worry about it – it’s our job to make sure you are enjoying the session, and to help you feel comfortable so that we can get the best photographs for you. There are absolutely no expectations of you, we just want you to have a good time. If you do have anything that you are particularly concerned about, please do let your photographer know beforehand, such as if you have a preferred ‘side’ or if there is anything about yourself that you don’t like in photos. Most people have something that they don’t like about themselves in photos (I hate my nose!) but if you let your photographer know this in advance, they can bear this in mind and shoot accordingly. Often people have not had professional photos taken before, so hopefully when you see the pictures from your photoshoot, you will be really pleased with the results and love all of them! This is a great opportunity for you and your photographer to get to know each other, and for you to have a lot of fun relaxing, laughing and spending time hugging your other half, while creating some stunning photographs that you will want to put all over your wall. Enjoy it! I have a Pinterest board here which contains lots of inspiration for your Engagement Shoot and ideas for things to do, different poses, different types of locations and clothing choices, etc. Take a good look through and see if there is anything that inspires you to try for your own photographs. I hope you have found this post helpful. If you would like to book an Engagement Shoot with Gemma Williams Photography, please do check out my website, and get in touch!